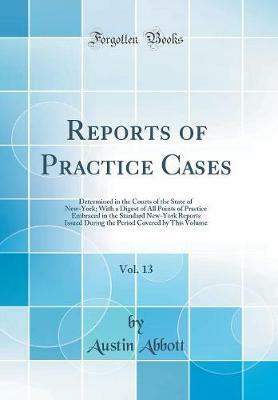 Excerpt from Reports of Practice Cases, Vol. 13: Determined in the Courts of the State of New-York; With a Digest of All Points of Practice Embraced in the Standard New-York Reports Issued During the Period Covered by This Volume Corporation - foreign, its assets cannot be distributed among the stockholders by order of our courts. About the Publisher Forgotten Books publishes hundreds of thousands of rare and classic books. Find more at www.forgottenbooks.com This book is a reproduction of an important historical work. Forgotten Books uses state-of-the-art technology to digitally reconstruct the work, preserving the original format whilst repairing imperfections present in the aged copy. In rare cases, an imperfection in the original, such as a blemish or missing page, may be replicated in our edition. We do, however, repair the vast majority of imperfections successfully; any imperfections that remain are intentionally left to preserve the state of such historical works. "Ms. Macomber is skilled at creating characters who work their way into readers' hearts...she masterfully moves the story along while not shortchanging the main plotline."